Mensusa https://www.mensusa.com/articles/navy-blue-tuxedos-the-last-word-in-the-fashion-world.html Navy Blue Tuxedos- The Last Word In The Fashion World Tuxedos have always given the best performance when one desired to look sophisticated and elegant. A tuxedo suit offers a fresh and smart look to the wearer on every occasion. But if you can select the appropriate shade like the navy blue tuxedos, you will surely rock the floor. Navy blue tuxedos have their own style and dignity by which they attract all fashion conscious men. Whether you are getting ready for an evening party or even a wedding party, your navy blue tuxedo will never let you down. By selecting the right designs and fit, you can easily achieve a decent look and surprise your friends. Tuxedos were the sophisticated suits of affluent men in the past. They were made of expensive materials and hence they were not within the reach of all alike. But when designers found that men from all walks of life were interested in these tuxedo suits, they created newer designs and used various types of fabrics to stitch the tuxedos. 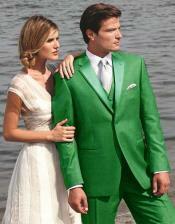 Color preferences too changed with fashion trends and men no longer wore only the black or white color tuxedos. Navy blue color came to the fashion world and won the hearts of sophisticated men and became the most sought after color in the tuxedo world. Navy blue tuxedos portray style and status and the uniqueness of this shade lies in the fact that it matches all skin tones, looks good on all occasions and you can dress them up and down as well according to the event. There is a wonderful collection of navy blue tuxedos spread out at MensUSA just for you. Pick out the ones that fit you well first and then think about the designs. You must never forget that the elegance of a man depends on the well-fitted attire that he wears and not only on the style or the cost of the attire. So when you buy the navy blue tuxedos try out the suits and then if you require any alterations, speak to the experts at MensUSA and they will help you out immediately. Select appropriate accessories that go well with the designs of the navy blue tuxedos and also the occasion. You can opt for the gorgeous navy blue tuxedos that are embellished with glossy buttons and ribbons for a wedding party, but choose the smart and sober ones for your official meeting to maintain your personality and position. You will get the slim-fits, double-breasted and the single-breasted navy blue tuxedos at MensUSA so that every customer can choose his wares without any problems. A tuxedo suit is a three-piece suit and naturally is unique and has a style of its own that cannot be ignored in any way. You just need to take care of the fits to flaunt your personality and make a style statement of your own. If you have at one of the navy blue tuxedos in your wardrobe, you will never be out of style. Combine the suit with other shades of shirts or trousers to create a new look on every event.